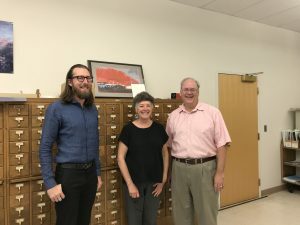 Left to right: Joseph Angelo, Margaret Van Dyk, Documents Catalogers, and Bradley Carrington, New Mexico State Library Technical Services Bureau Chief. Back in March, 2017, a post titled, “State Library joins Library of Congress Program” ran in the Hitchhiker announcing a new and significant partnership between the New Mexico State Library’s catalogers and the Library of Congress’s Program of Cooperative Cataloging. The catalogers became members of the Name Authority Cooperative (NACO). Membership in this cooperative requires rigorous training and review by experts. Our catalogers achieved this benchmark. We continue to adhere to the cataloging standards set forth by this program. If you venture into the Technical Services Department, you might find us documents catalogers huddled together. You might wonder what is going on. Training! And more training! We are working towards a new benchmark. The New Mexico State Library will join BIBCO when we pass muster. In October, we will meet with Larisa Walsh from the Regenstein Library, University of Chicago. Ms. Walsh will present a BIBCO Training Webinar for New BIBCO Members, after which she continue to work with us and review our work. Catalogers are forging a future that will include our important work. That future involves sharing resources. The days of ‘every library every book’ are long gone and libraries are finding ways to create efficiencies and share the world of knowledge with a global audience. One of those efficiencies is sharing bibliographic records. As I see it, cataloging is turning on its head. From a focus on precision and language efficiencies that mostly only catalogers fully understand, we are moving into a user centric and prose environment. New BIBCO cataloging standards will shape the future. Information seekers will have an easier time finding the resources they need. That future involves sharing resources. So yes, we are training for BIBCO proficiency. What on earth does BIBCO stand for? A quick internet search… and I came up with Beaver Island Boat Company. No. That’s not it. BIBCO means ‘monographic bibliographic record component of the Program for Cooperative Cataloging. Condensed, catalogers at the New Mexico State Library are part of a world-wide cooperative movement. We continue the essential work of catalogers in libraries, but, we also are the exemplars of metadata description.